Due to its high commercial value, live rock is a promising candidate for aquaculture. This poses interesting challenges, as our knowledge of live rock development in aquaculture is limited. The current preliminary study investigated the effects of rock preconditioning and irradiance on the growth of crustose coralline algae (CCA), a desired group of benthic calcifying algae. 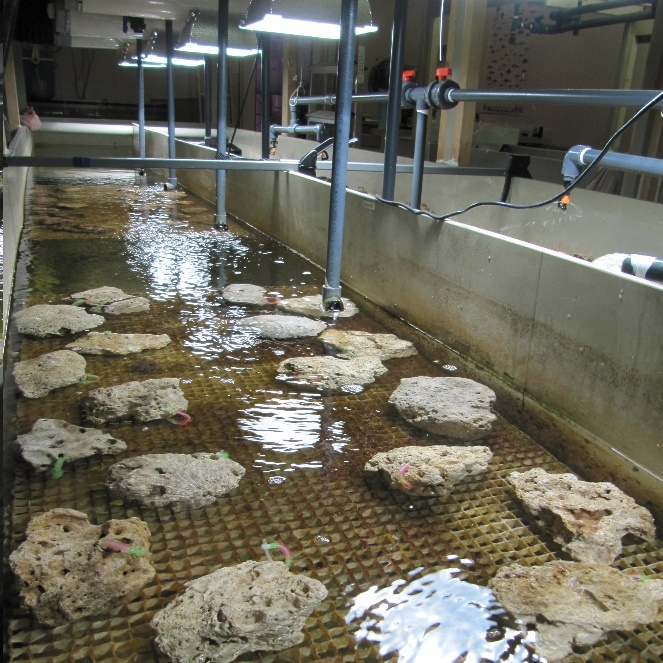 Two types of rock (initially bare coral rock and rock preconditioned for 12 weeks under low light) were cultured in a 15,000 liter recirculation system under two light levels (PAR of 80 versus 180 µmol m-2 s-1), resulting in four treatment combinations (N=10 rocks per treatment). The growth of pink and red CCA’s was monitored over a 9-week period. In general, pink CCA’s developed more quickly than red CCA’s, with 4.31-10.44% versus 2.45-4.56% cover after 9 weeks, respectively. Pink CCA grew more quickly on non-preconditioned rock; after 9 weeks of culture, pink CCA showed higher percentage cover and larger colony size on initially bare rock compared to preconditioned rock. In contrast, red CCA showed higher percentage cover and colony density on preconditioned rock. Although higher pink and red CCA colony densities were found at higher light intensity, no effect of irradiance was found on relative CCA cover. In addition, red CCA colony size was larger at the lowest irradiance, for both rock types. These results suggest that pink CCA are pioneer species, which colonize bare substrates more quickly than those covered with a biofilm. Red CCA’s, on the other hand, seem to prefer biologically preconditioned surfaces and require more time to develop. As irradiance had no effect on relative CCA cover, live rock aquaculture may be more cost-efficient at lower irradiance levels. Our results provide insights into live rock development in aquaria, which could benefit sustainable aquaculture initiatives. At present, there is a high demand for live rock for home and public aquaria, which may locally impact coral reefs. Due to its high commercial value, live rock is a promising candidate for aquaculture. When cultured locally, reduced transportation costs and CO2 footprint of live rock become additional advantages. This poses interesting challenges, as our knowledge of live rock development under aquaculture conditions still is limited. For example, it is unclear which factors control the growth of highly valued calcifying algae on live rock, known as crustose coralline algae (CCA). These CCA’s provide live rock with an attractive purple, red and pink coloration, which is crucial for good market value (Wabnitz et al. 2003). In addition, CCA’s play an important role in the settlement of invertebrate larvae such as coral planulae (Negri et al. 2001), and contribute to reef formation (Björk et al. 1995; Johnson 2014). Although it is known that water quality and irradiance play critical roles in CCA growth (Björk et al. 1995; Belliveau and Paul 2002; Chisholm 2003), little is known about how substrate type affects CCA growth. The current preliminary study investigated the effects of rock preconditioning and light intensity (irradiance) on the growth of crustose coralline algae (CCA). Two types of rock were cultured under two irradiance levels each (180 µmol m-2 s-1 and 80 µmol m-2 s-1), resulting in four different treatment conditions. The first rock type was old live rock, which had been cleaned and dried previously, with no remaining marine life. The second type of rock came from the same batch described above, but was preconditioned in a seawater culture system for three months under low light conditions. This resulted in a thin film of bacteria and green algae. The question addressed was: how does rock preconditioning, resulting in a biofilm of marine algae, bacteria and other organisms, affect the development of CCA’s in aquaculture? The results emanating from this study provide insight into CCA development in aquaculture, and could help aquarists to create the preconditions for the development of specific types of desirable CCA’s. To seed the experimental rocks with CCA’s and other organisms, about 250 kg of live rock was co-cultured in an aquaculture system. 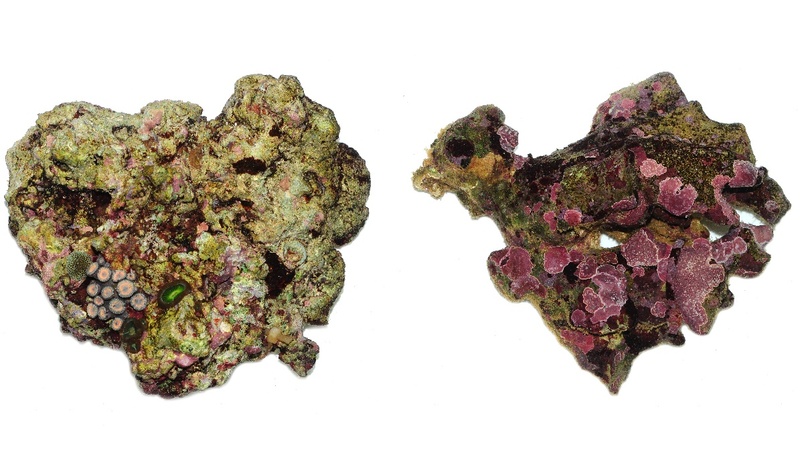 This rock contained both pink/purple and red CCA’s, as well as fleshy macroalgae (Ulva sp. ), scleractinian corals (Porites sp. ), calcifying macroalgae (Halimeda sp. ), polyps (Zoanthus sp. ), and other unidentified organisms. These rocks were placed both in the main culture basin as well as in two 200L aquaria above the main basin. 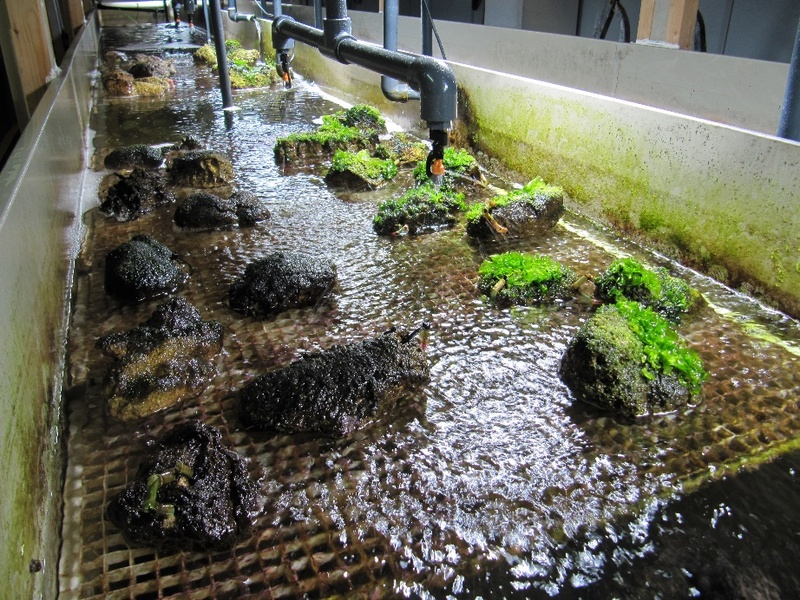 The water flow of the aquarium outlets released directly upstream of the experimental set-up to possibly enhance the presence of seeding material. A 12 m3 hour-1 return pump (Aquamedic GmbH, Bissendorf, Germany) constantly exchanged water between the main basin and the two aquaria. Figure 1: Two of the live seed rocks used to seed the experimental rocks. It is important to note that all rocks had different compositions of benthic life, with various species of algae and invertebrates. To control the growth of turf algae and macroalgae, herbivorous fishes (Zebrasoma flavescens, Siganusguttatus and Ctenochaetus spp. ), urchins (Diadema setosum, Echinometra mathaei) and snails (Turbo sp., Trochus maculatus) were kept in the main culture basin and the 200L aquaria. Forty rocks of roughly 20 x 10 cm in size were used for the experiment. These rocks were randomly chosen from a batch that was once live rock, which had been cleaned thoroughly and subsequently stored dry for several years. As such, the complex structure of the rocks remained, but all life had been removed. Twenty rocks were incubated for 12 weeks in a marine aquaculture system (see below) under low light (irradiance of <50 µmol m-2 s-1), resulting in a biofilm with bacteria, green and brown algae but almost no CCA’s. The other twenty rocks were stored in darkness at room temperature. At the start of the experiment, all forty rocks were subjected to the same culture conditions, and exposed to two different irradiance levels (see Experimental design and figures 2 and 3). Figure 2: Schematic overview of experimental design. Forty rocks in total were used for the experiment. One group (N=20) was stored dry in darkness for 12 weeks, the other group (N=20) was aquacultured under low light for the same duration. Both rock types were split into two groups (N=10 per group), which were subjected to an irradiance of 180 and 80 µmol m-2 s-1, effectively creating four conditions. Figure 3: An overview of the experimental setup, with the two groups of initially bare rocks at the front (with 180 µmol m-2 s-1 on the right, and 80 µmol m-2 s-1 on the left) , and the biologically preconditioned rocks in the back. On the right side of the basin, a sprinkler system can be seen, which was used for a related experiment. All rocks, including the seed rocks, were cultured in a 15,000 liter system. Filtration was provided by a 1000 liter denitrification reactor (Dynamic Mineral Control or DyMiCo, US patent no. 6,830,681 B2, EcoDeco BV, Utrecht, The Netherlands). The reactor removes inorganic nutrients and releases calcium, magnesium and bicarbonate to maintain water quality. Six 300W Pro 300 Light Emitting Plasma (LEP) fixtures (Gavita Nederland BV, Aalsmeer, The Netherlands) were used to obtain a homogeneous light distribution. All rocks were placed at a water depth of approximately 20 cm on white egg-crate (AquaHolland, Dordrecht, The Netherlands). Irradiance was measured at 20 cm space intervals at approximately 20 cm water depth with a 192SA quantum underwater sensor (LI-COR, Lincoln, USA), which measures photosynthetically active radiation (PAR, ~400-700 nm). Irradiance was set to 180 µmol m-2 s-1 directly underneath the lamps (also see experimental design). The spectral quality of the LEP fixtures was measured at 50 cm space intervals at approximately 20 cm water depth with a calibrated Jaz spectrometer (Ocean Optics, Dunedin, USA). The spectrometer was connected to a laptop computer and measured spectra were stored. The LEP fixtures showed a balanced irradiance over the entire visible spectrum, with an exception of two dips around 412 and 452 nm. Irradiance of UV-A (315-400 nm) and infrared (>780 nm) was also measured. A timer switched the lamps on at 07:45h and off at 20:30h, resulting in a 12.75:11.25h light:dark ratio. All treatments lasted 9 weeks. 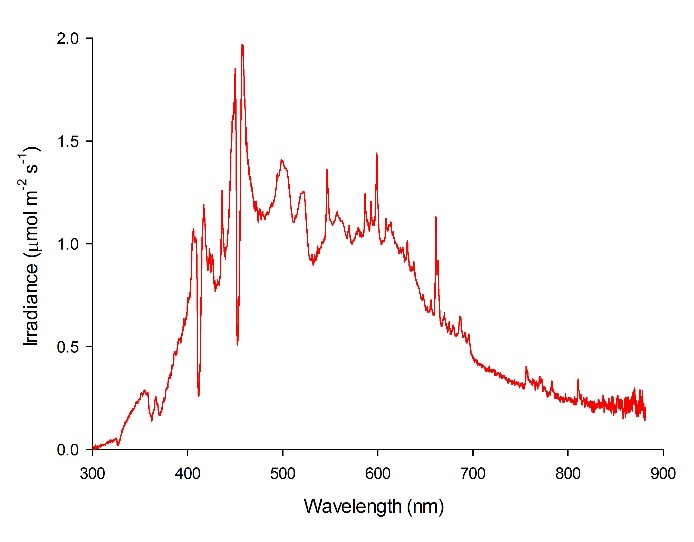 Figure 4: Spectral analysis of the LEP fixtures used. Water quality was measured regularly. Calcium, magnesium and alkalinity were titrated using home test kits (Salifert BV, Duiven, The Netherlands). Ammonia-nitrogen (NH3-N), nitrate-nitrogen (NO3-N), and phosphate-phosphorus (PO4-P) were measured with a Hach DR890 colorimeter (Hach-Lange GmbH, Düsseldorf, Germany) according to the manufacturer’s protocols. To measure CCA development on the experimental rocks, each rock was removed from the culture system and photographed weekly, from week 0 to 9 (except at week 1 due to time restrictions) with a standardized setup. 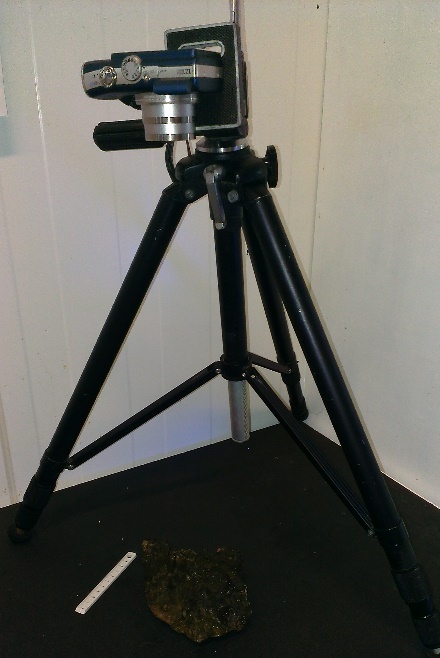 A Canon PowerShot SX200 IS was mounted on a tripod, which in turn was positioned on a flat, black table. Each rock was positioned directly underneath the camera, which was oriented downwards. A ruler was juxtaposed to each rock for scale. To improve photograph sharpness, a self timer with a two second delay was used. A flash was used at all times. Zoom was never used. Figure 5: Setup used to photograph all rocks. A centimeter scale was used for reference. All photographs obtained were analyzed using ImageJ (http://imagej.nih.gov/ij/). Using the reference ruler, the 2D surface area of each rock was measured, as well as the total surface area of CCA’s on a given rock, expressed in cm2. Using the count function, the number of CCA colonies on each rock was also determined. All data were transferred to Microsoft Excel and IBM SPSS for further analysis. The following dependent variables were calculated: percentage CCA cover, CCA colony density and CCA colony size. Normality of data was evaluated by plotting residuals of each dataset versus predicted values, and by performing a Shapiro-Wilk test. Homogeneity of variances was determined with Levene’s test. All data were found to be normally distributed and showed homogeneity of variance after a 10log transformation (p>0.050). A two-way factorial analysis of variance (ANOVA) was used to determine main and interactive effects of rock type and irradiance on CCA cover, CCA colony density and CCA colony size. Simple effect contrasts were used to elucidate interactive effects. Statistical analysis and graph plotting was done with IBM SPSS Statistics 22 (IBM Corp., Armonk, USA). All data presented are means ± standard error (S.E. ), unless stated otherwise. On all rocks, pink CCA growth was noticeable within the first four weeks. Pink CCA cover steadily increased up to 10.44% over the nine-week period, with the fastest growth observed on initially bare rock under the higher irradiance applied (figure 6). A significant effect of rock type on pink CCA cover was found (table 1), with a higher cover on initially bare rock compared to biologically preconditioned rock after nine weeks. No effect of irradiance was found (table 1), however, an interactive trend between irradiance and rock type was detected. A follow-up contrast indicates that pink CCA cover after nine weeks was higher on bare rock compared to preconditioned rock under the higher light level only (F1,36=16.007, p=0.000). Under the lower light level, no significant difference between rock types was found (F1,36=2.327, p=0.136). Figure 6: Pink CCA cover (%) over the course of 9 weeks. Values are means ± S.E. (N=10). Red CCA took more time to develop compared to pink species (figure 7). Not until the sixth week could growth be observed on all rock types. Red CCA cover steadily increased up to 4.56% within the nine-week period, with the fastest growth observed on biologically preconditioned rock (figure 7). A significant effect of rock type on red CCA cover was found (table 1), with a higher cover on preconditioned rock compared to bare rock after nine weeks. No main or interactive effect of irradiance was found (table 1). Figure 7: Red CCA cover (%) over the course of 9 weeks. Values are means ± S.E. (N=10). Pink CCA density increased more quickly under the higher irradiance applied, and stabilized at different levels depending on treatment (figure 8). The highest plateau was observed for initially bare rock under 180 µmol m-2 s-1, with a mean of approximately 0.5 colonies per cm2 rock. No significant effect of rock type on pink CCA density was found (table 1). Irradiance, however, did have a significant effect on pink CCA density (table 1), with a higher density under the higher irradiance applied. No interaction was found (table 1). Figure 8: Pink CCA density (colonies cm-2) over the course of 9 weeks. Values are means ± S.E. (N=10). Red CCA density increased more quickly on biologically preconditioned rock (figure 9). In addition, higher densities were found at the highest irradiance applied after nine weeks. A significant effect of rock type on red CCA density was found (table 1), with the highest density found on preconditioned rock. In addition, a significant effect of irradiance was found (table 1), with a higher density found at 180 µmol m-2 s-1 as compared to 80 µmol m-2 s-1. No interactive effect of rock type and irradiance on red CCA density was found (table 1). Figure 9: Red CCA density (colonies cm-2) over the course of 9 weeks. Values are means ± S.E. (N=10). Pink CCA colony size increased most clearly on initially bare rock (figure 10). After nine weeks, a significant effect of rock type on pink CCA colony size was found (table 1), with larger colonies on initially bare rock. No main or interactive effect of irradiance was found (table 1). Figure 10: Pink CCA colony size (cm2) over the course of 9 weeks. Values are means ± S.E. (N=10). Red CCA colony size increased more quickly on biologically preconditioned rock (figure 11). Although red CCA growth on initially bare rock started several weeks later compared preconditioned rock, colony size was comparable between rock types after seven weeks. After nine weeks, no significant effect of rock type on red CCA colony size was found (table 1). A significant negative effect of irradiance was found (table 1), however, with a larger colony size under the lower irradiance applied. No interaction between rock type and irradiance was found (table 1). Figure 11: Red CCA colony size (cm2) over the course of 9 weeks. Values are means ± S.E. (N=10). 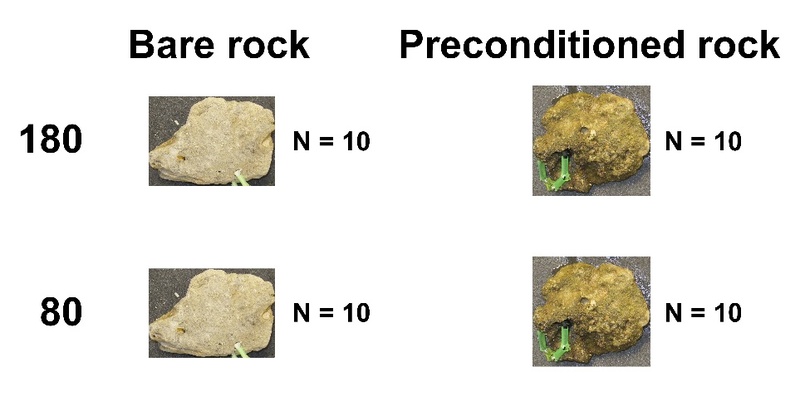 Figure 12 shows rocks from each of the four groups. Fast-growing green algae colonized the rocks first. The surgeonfishes kept the rocks free from longer turf algae and fleshly macroalgae, allowing CCA’s to slowly develop. Figure 12: Representative rocks of all four treatments at week 0, 5 and 9. The values 180 and 80 indicate the applied irradiance, expressed as µmol m-2 s-1. Table 1: Two-way factorial ANOVA, demonstrating main and interactive effects of rock type and irradiance on relative CCA cover, CCA colony density and CCA colony size (N=10). Water quality in the system was quite constant throughout the experiment, with elevated alkalinity, and nitrogen and phosphorus concentrations compared to natural conditions. Table 2: Water quality during the course of the experiment. Values are means±s.d. (N=8). Our preliminary study indicates that the initial state of rock used affects the development of CCA’s in aquaculture. Rock that had no initial biofilm of algae and bacteria was more conducive to the growth of pink CCA species (under the higher irradiance level applied), whereas rock that was preconditioned for 12 weeks was more quickly overgrown with red CCA’s. Although differences in growth rates between rock types may seem marginal (i.e. red CCA cover on initially bare rock lagged only about a week behind cover on preconditioned rock), it does provide new insight into CCA development. Our results suggest that pink CCA’s are pioneer species, which colonize bare substrates more quickly than those covered with a biofilm. Red CCA’s, on the other hand, seem to prefer biologically preconditioned surfaces and thus require more time to develop. In addition, red CCA’s generally seem to grow more slowly, with only 4.56% maximum cover after 9 weeks, versus 10.44% maximum cover by pink CCA’s. Although higher pink and red CCA colony densities were found at higher light intensity, ultimately no effect of irradiance was found on relative CCA cover. This finding suggests that aquaculture of live rock may be more efficient at lower irradiance levels. This insight is crucial for developing cost-effective aquaculture protocols for live rock, as energy is a major cost involved, next to human resources. The presence of herbivorous fishes and urchins in the culture system is a major variable to consider. Just like on coral reefs, the surgeonfishes kept the rocks devoid of turf algae and fleshly macroalgae, allowing CCA’s to develop. Without herbivores, fleshy macroalgae will quickly develop and curtail CCA growth (Belliveau and Paul 2002). The results obtained in this study are therefore applicable only to systems in which sufficient herbivores are maintained. Figure 13: When rocks are inaccessible to herbivores, such as when they are sprinkled with seawater, fleshy macroalgae such as Ulva sp. quickly develop and prevent CCA growth. Under low light conditions, however (left group in the photograph), macroalgal growth is much less apparent. Although all rocks were cultured in the same system, and thus exposed to the same seeding rock and water chemistry, only one system was used. Therefore, the rocks do not represent authentic, independent replicates. This issue is known in science as pseudoreplication, and to overcome it, at least three separate culture systems are required. These systems should result in three similar outcomes, proving the reproducibility of the experiment. However, this would have required substantial resources and was not possible at the time. Future experiments will therefore have to demonstrate the reproducibility of this preliminary experiment. Herein lies a possible role for aquarists, who together can accumulate a significant amount of data from independent systems. Water quality may also have impacted the experiment, as nutrient levels were elevated compared to pristine coral reefs. As recruitment rates of CCA’s may be negatively affected by higher nutrient levels (Belliveau and Paul 2002), our results may be specific to eutrophic systems. Aquaculture systems with lower nitrate and phosphate levels may result in faster recruitment and growth of the CCA’s described above. We would like to acknowledge Alco Nijssen of HZ University of Applied Sciences and Ronald Osinga of Wageningen University for their support.